It is no secret that I have a bit of an obsession with shoes. I mean what girl doesn't right? Platform booties have been on my fall lust list for quite sometime now so I was super excited when I found these on SoleSociety.com , a new website stocked with adorable shoes galore in more styles than you can imagine. What really gets me about Sole Society is the quality they offer for such a reasonable price (we're talking genuine leather/suede at less than $50 a pop). Other perks include their free shipping and the fact that new items added every single day. Anyway, in honor of their new designs launching by Julliane Hough, their first celebrity collection, Sole Society is offering you lovely readers 20$ off your first purchase until Dec.15th by using the discount code FOS20 ! So go ahead, get to shopping here! Very nice and romantic! Love it! I really love how you combine colours! Look how cute you are, with your lipstick matching your coat! Stop by my blog if you can, mine is all about thrifting and saving money; plus I just did a post on my new Paraders dress and a floral crown, plus I'm doing a give-away tomorrow! Hooray! Thanks so much! this is beautiful! Amazing shoes!! This look is perfectly romantic for fall Bonnie! Great lace dress and yes, I agree, every girl needs a platform bootie in their life! So cute, love the blue ones! Those boots are a great find and I am loving your red and camel combination. Great inspiration, Bonnie! those shoes are FAB! absolutely love them! sO LOVELY!!!! LOVE THIS OUTFIT! Love the boots and coat. Great colour combo. Beautiful look, I love the red coat! Beautiful outfit! I adore your boots! The red blazer coat is such a bright pretty pop of colour! Also love your new shoes, platform booties are so pertfect for Autumn. 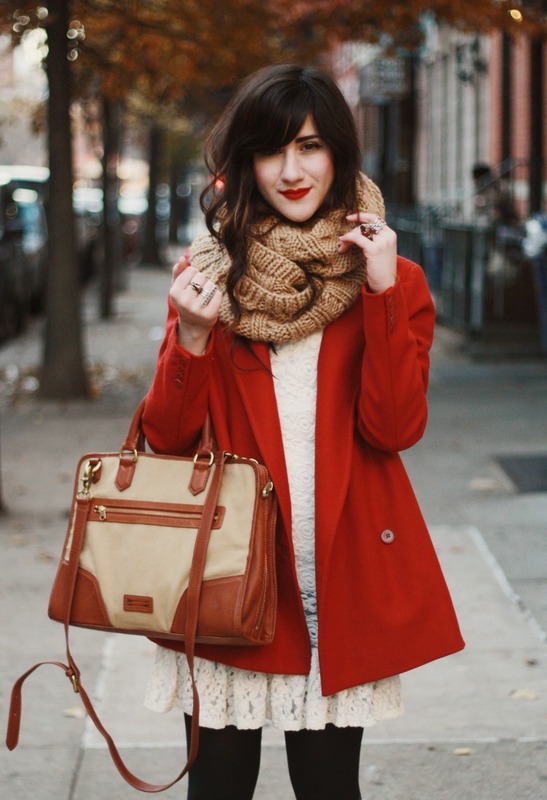 Beautiful outfit, really like how the scarf compliments your bag! I might be shopping at Sole Society soon, loving those shoes. Those heels are gorgeous - I love the blue paired with black/red. Love the oversize coat, and really nice booties, love its color. Sent you an email and FB message too- can’t wait to hear back from you! I love that red blazer! :) Your blog is absolutely fabulous-just became a member/follower of your blog on Facebook. I hope you'll follow me back and we can keep in touch. Happy Blogging!!! Gorgeous outfit, I love how your lips and coat work in together. 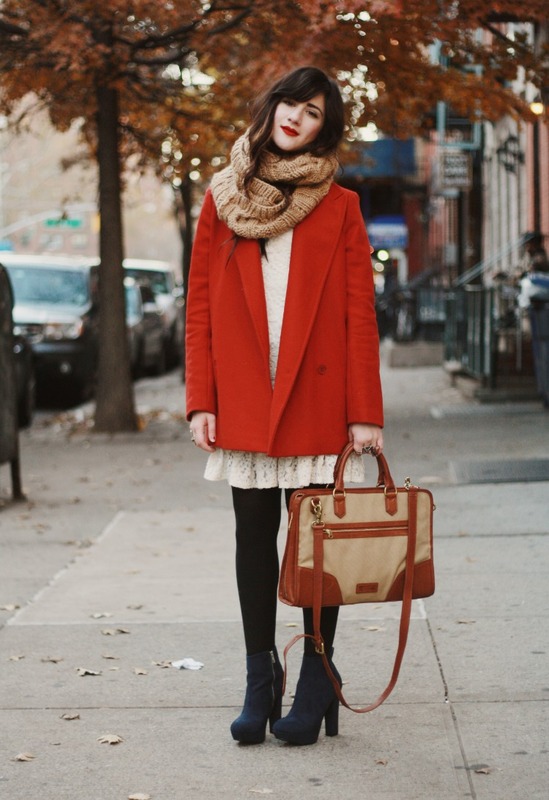 Love your boots and the complete outfit is wonderful, the white lace and the red coat are made to go together ! i'm in love with the bag.. where did you get it?? lovely! Those shoes are SUPER cool. You look great.